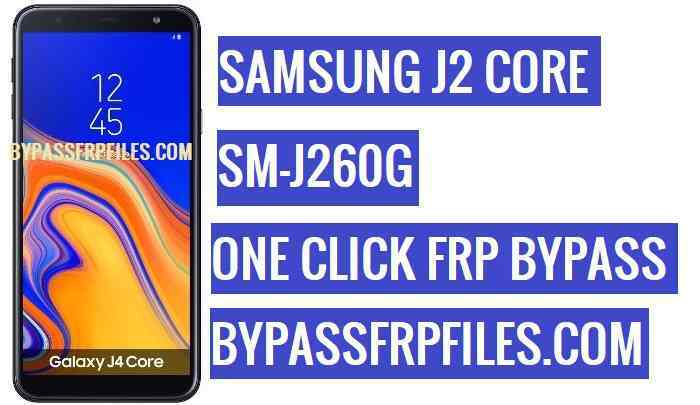 There are couple of method available for Frp unlock of Samsung galaxy J2 Core, and most of them are told you to download a big volume of Stock firmware and Combination file, But with this method you don’t need any type of combination files and official firmwares just download a small size of files and flash the file with Odin and then you will successfully Bypass Samsung J2 Core FRP, with this method you can easily Bypass SM-J260G FRP download Odin and the FRP Remove File then follow this step by step. Make Sure: We tried this Method on Samsung Galaxy J2 Core, also you this method helps you to Bypass FRP from SM-J260G FRP Bypass. Note:- we share here SM-J260G U1 FRP File and SM-J260G U2 FRP File first check the bootloader version of your device then follow this process. Samsung has updated their security level and fixed all the old security bypassing process that help us to unlock FRP, so we are always working to find a new method to Bypass Samsung J2 Core FRP easily. -After that, Press and hold the (Volume Up and Power Key) together, until you see Android logo appear on your device screen. -After that, press (Volume UP and Power) key same times once to SM-J260G FRP. -Then there you will see your device firmware version (J260GXXU2ARG5). -Now note down the firmware details then download the frp file according to your device firmware version. Make Sure:- If your device have “U1” version bootloader then download same version FRP file, or if you have U2 version then download the U2 file. -Once you downloaded the FRP File, then power off your device. -Then press and hold the (Volume UP and Volume Down and Connect USB Cable), until you see “warning” screen in your device. -After that, confirm to Press “Volume UP” download mode. -Once you put your device in to the download mode. -Then follow the next method to Bypass Samsung J2 Core FRP. -First of all, download the Odin file from here. -Then extract the Odin file to your PC. -Now there you will see “Odin.exe”. -Now click on the “AP” tab and then give the file path of extracted SM-J260G FRP file folder there. -Ok now check on the “Log Box” there you will see “ADDED” message. -Now hit the “START” button on the Odin tool to successfully Bypass Samsung J2 Core FRP -Android-8.1. -Wait some time to finish Flashing. -Once the flashing finish then disconnect your device form pc, then power on your device. -Then wait for power on succesfully then check you have successfully unlock FRP from your device. Thanks for visiting us, Comment below if you face any problem With Bypass Samsung J2 Core FRP (SM-J260G FRP) With FRP Bypass File we will try to solve your problem as soon as possible.